Turkish penal courts decided to keep two jailed journalists in detention, state-run news agency Anadolu said yesterday (11 January), hours after a top court had requested they be released because their rights had been violated while in custody. Mehmet Altan and Sahin Alpay, jailed for more than year amid large-scale purges of the media and state institutions after a failed 2016 coup, were accused of links to terrorist groups and attempting to overthrow the government, charges they deny. Separate penal courts decided to reject the Constitutional Court ruling that they should be freed. Sezgin Tanrikulu, a lawmaker from the main opposition Republican People’s Party (CHP), said on Twitter that the penal courts’ refusal to release the two was not legal and that they were being falsely imprisoned. According to court records, the Constitutional Court had earlier said: “It was decided … by a majority of votes that their freedom of expression and (the freedom of) press, protected under … the constitution, were violated”. Altan is a professor of economics and frequent commentator in liberal Turkish media. Alpay is a columnist. The two men, along with a third journalist, Turhan Gunay, had argued that their arrests were illegal and that their rights and freedoms had been violated during pre-trial detention. Eleven of the court’s judges ruled in their favour and six against, the opposition Cumhuriyet newspaper reported. Officials from the various courts were not immediately available for comment. Gunay, a Cumhuriyet journalist, was released in September following a ruling in a separate case. The Constitutional Court ruled on Thursday that Gunay’s rights had also been violated during his time in detention. Turkish authorities have jailed more than 50,000 people and shut down some 130 media outlets in the post-coup crackdown. Around 160 journalists have been imprisoned, according to the Turkish Journalists’ Association, and rights groups say Turkey is now the world’s largest jailer of journalists. Many of the jailed reporters have been charged with spreading propaganda for the outlawed Kurdistan Workers Party (PKK) or the network of U.S.-based cleric Fethullah Gülen, whom Ankara accuses of masterminding the abortive putsch. Gülen, a former Erdogan ally, has lived in self-imposed exile in the United States since 1999. He has denied orchestrating the coup and condemned it. Alpay wrote for the now-defunct Zaman, widely seen as the Gülen movement’s flagship daily before its seizure by the authorities and subsequent closure. Erdogan has said that some journalists helped nurture terrorists through their writing, and says the crackdown is needed to ensure stability in Turkey, a NATO member that borders Syria, Iraq and Iran. Critics say Erdogan is using the post-coup crackdown to muzzle dissent and tighten his grip on power, charges he denies. The European Union, which Turkey aspires to join, has also criticised the crackdown. 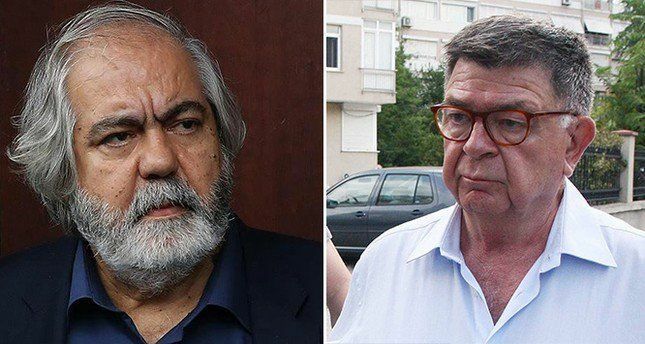 Sweet and sour: Turkish Constitutional Court calls for release of journalists Sahin Alpay and Mehmet Altan, while Turkish Parliament revokes seat of HDP MP and Sakharov Prize Laureate Leyla Zana. Erdogan = Mugabe 2 – which ended oh so well. Anybody that takes a holiday in Turkey is indirectly supporting Erdogan. Mugabe? I thought he was a sort of Hitler imitator.